"There is a good to great chance that if you’re reading this right now you remember the days of rims like the Mavic G40 and their equivalent counterparts from Ambroisio, Campagnolo, Rigida, and a host of others back in the day that are no longer around as companies even. Many races were won on these rims with no machined sidewalls and hard anodized in dark grey, black, and shades in between. Heck, for many years in modern times even for Paris-Roubaix pro mechanics would lace up similar rims to traditional hubs for racers to use despite fancier carbon/deep profile/low spoke count wheels aero wheels used the rest of the year because in the end, Roubaix could destroy a new set in a day and it’s a race that tests the machine as much as it tests the rider. Durability isn’t the only factor at Paris-Roubaix either, low profile rims not only are more comfortable but track the ground better which is paramount in the cobbles to staying upright at all. In short, despite market trends, the low profile rim is far from obsolete. Of course, this is old news to riders who ride year round on their road bikes and commute in all sorts of weather on such. Training wheels have always been built with such rims because of their durability and comfort throughout the year by racers for this very reason. In the end, whether you’re racing or just plain riding a lot, traits like comfort and durability never go out of style. People have been known to horde spare rims and finding older version of such often means paying the types of prices supply and demand dictates to the consumer on Ebay. Some of our favorite classic rims in NOS (new old stock) condition are often $150-$200 per rim. While such may be great for a restoration project, they no doubt are priced out of range of the common man seeking such. And while such classic rims are as durable and comfortable as they were back in the day, they lack a profile that’s compatible with modern tire widths and have internal rim widths as low as 13mm wide and even outer rim widths rarely sneak past 20-21mm. Great for a time when a 23mm wide tire was for training and anything bigger was a heavy touring tire that lacked the smooth ride qualities of today’s modern 25mm-28mm road tires. No, a modern version was in need. Which is why no doubt that Soma decided to make a modern version of the classic low profile classic road rim with their El Niño rim. Key updates to our favorite rims of days gone by include bumping rim width up to 24.4mm outside width, and 19.9mm internal rim width coupled with decades of subtle improvements in manufacturing and aluminum quality. 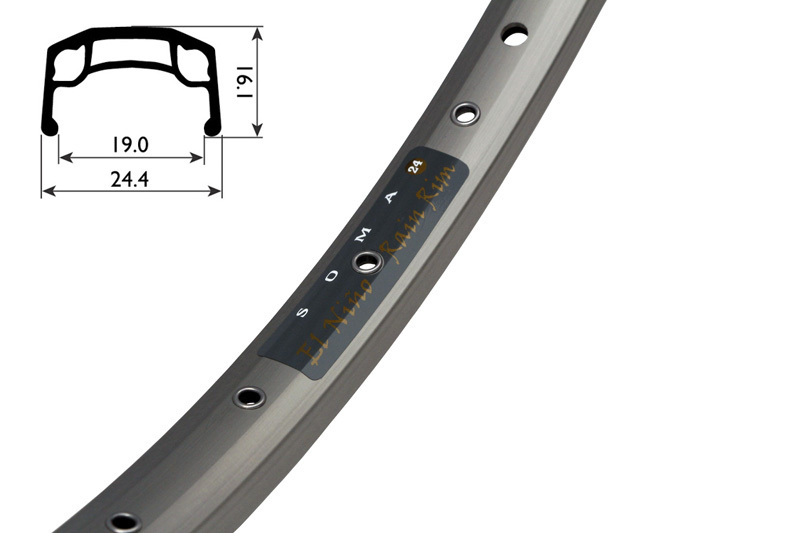 Yet a low 16.1 rim height, old school rim eyelets, and classic long wearing hard anodizing still remain. 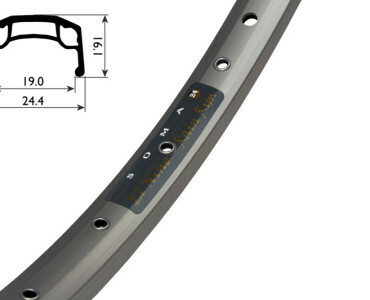 Bonus: These rims are also available in 650b as well as 700c. So who’s this rim for? Aside from those who just miss the classic ride qualities of the rims of yesterday and the durability don’t let the nostalgic tone diminish the applications of such rims. Personally, I went with these rims laced up to disc hubs and in 650b. 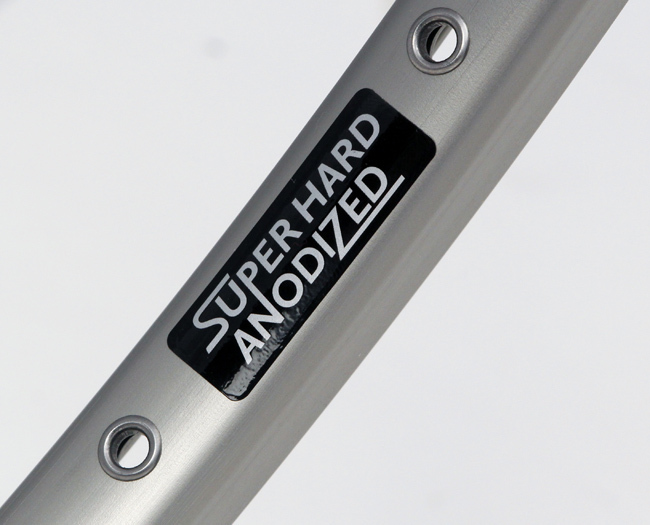 The classic look of these low profile hard anodized rims without a machined brake track makes them fantastic for disc use brakes applications. I comfortably, and I do mean comfortably, used these rims with 2.2” x 27.5 mountain bike tires as well as 48mm x 650b gravel tires. No doubt, parking these up with Soma’s Supple Vitesse SL or EX versions would be even more comfortable and the idea of trying the Soma’s 650b Cazaderros in either 42 or 50mm on the wheels I built makes me swoon. No doubt, a similar sense of bliss will be derived in the 700c versions as well. One other application to consider is the conversion of old school 700c frames which traditionally supported only 23-25mm wide tires to 650b with these rims and a 38mm wide 650b tire is something to consider. I encourage shops to keep on hand a set of wheels built to traditional road hubs along with a long reach caliper set like the Dia Compe BS202’s (Or similar) to help customers see if such will fit in their frame as there is no cold hard spec you can safely guess will work. Having a set of such wheels and brakes will help you figure out whether or not a customers old frame can be updated easily to such or not.